For high school students interested in a career in architecture, art or product design, the UO Design Camp at the White Stag Block in Portland might be the perfect solution for what to do this summer. The camp runs July 10-14 and offers participants a chance to get a head start through experience in collaboration, creative problem-solving and prototyping. This year’s theme will be “Connections” and will explore ways to connect people. Atallah is teaching the architecture module, Mike Bartell is teaching product design and Liz Bayan is teaching the arts and technology piece. “They collaborate and teach the camp together as a progressive series of lessons with field trips built in to produce products in each discipline under their overarching theme,” said Sara Knott, the administrative services manager in the UO School of Architecture and Allied Arts. While the architecture aspect of the camp focuses on model-building and offers a chance to explore Portland’s own architecture, students will also have the opportunity to learn about digital technologies such as animation, graphics and web design with an art and technology focus. 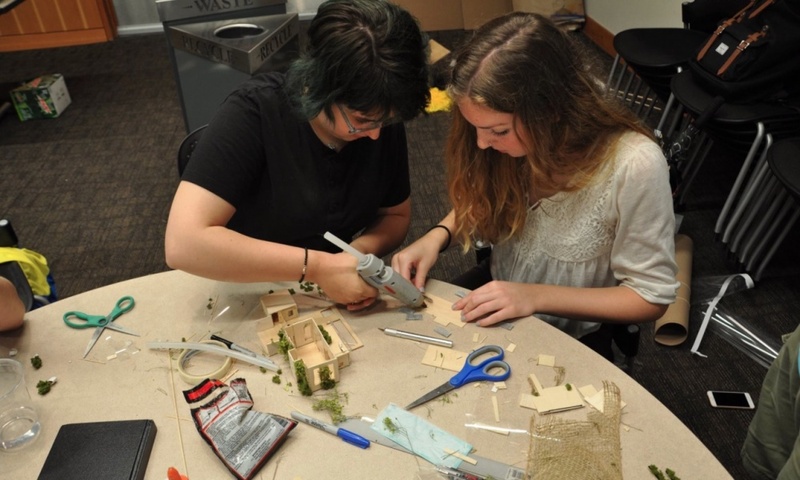 The product design curriculum lets students design and prototype products. All camp instructors are working professionals in their field and alumni of the School of Architecture and Allied Arts. Past themes have included a music festival, city resiliency, bikes, parks, water, food carts and the James Beard Public Market. “Students have designed leather bike badges, a wrist mounted mp3 player that lights up with the music at music festivals, a bike-in theater and even a Fitbit-like product for a hamster,” Atallah said. At UO Design Camp, students are encouraged to dig deeper into the field that interests them by interacting with professionals and also the tools and techniques of the trade. They gain experience in sketching, computer-aided drawing, prototyping, model-making, drafting and brainstorming from a professional and academic point of view. “All of the instructors give presentations that help the students get to know the fields and then lead activities that help teach the students some of the skills they will learn and use in those fields,” said Atallah, who has been an instructor for the past several years. Atallah added that the students get a chance to experience group work with complete strangers on a very tight timeline. “They produce quite a lot of work in just four-and-a-half days and leave each day tired but start the next day eager for more,” he said. For more information, visit https://aaa.uoregon.edu/uo-design-camp or https://www.facebook.com/UODesignCampPDX/.